This portal is a platform for knowledge sharing and dissemination on the decentralized district planning process run by the National Resource Cell for Decentralized District Planning (NRCDDP). The NRCDDP is an initiative by the Planning Commission of India and UNDP as part of the Government of India-United Nations Joint Programme on Convergence (GoI-UNJPC), which promotes decentralized and convergent planning and development in the country. The NRCDDP emerges from a need for national leadership in different aspects of policy and practice on local development planning and implementation at district and sub-district levels. The cell adopts a polycentric approach for accessing, developing, and disseminating knowledge inputs on decentralized district planning and decision making in order to strengthen a conducive environment for humane, inclusive and sustainable growth. The cell works closely with the Planning Commission, State governments, State planning institutions/agencies, UNDP and other UN agencies for providing knowledge support to integrated, decentralized and multi-sectoral district planning and programme management processes across States. While NRCDDP has all the States of the country within its functional compass, it begins with a focus on seven States (Bihar, Chhattisgarh, Jharkhand, Madhya Pradesh, Odisha, Rajasthan and Uttar Pradesh). Gradually, the interventions will comprehensively extend to all States. 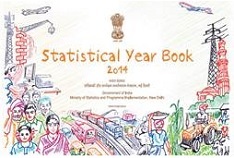 Statistical Year Book 2014, Ministry of Statistics and Programme Implementation.